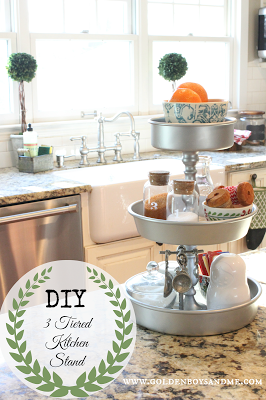 I use tiered stands all over the house to stay organized. When I diy-ed my first tiered stand a couple of years back, I thought it would mostly be a decorative item. However, I quickly learned that they are actually very useful. 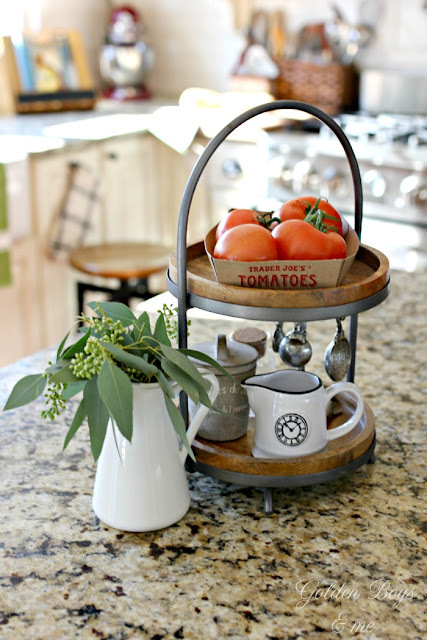 So when I spotted this painted wood stand at HomeGoods, I knew it would be coming home with me for our kitchen island. I have had my eye out for one just like this. We use it to store fruit in bowls, measuring cups & spoons and salt & pepper. I like that it keeps everything corralled on the island. I still have the diy stand I made from candle sticks and cake pans. You can find out how I made it here. It isn't quite as large as the new one, but it will still be on the rotation and will be used again. As will the wooden stand from World Market. The wood on this one gives it more of a fall feel to me. Although it is smaller, it still holds a few necessities. 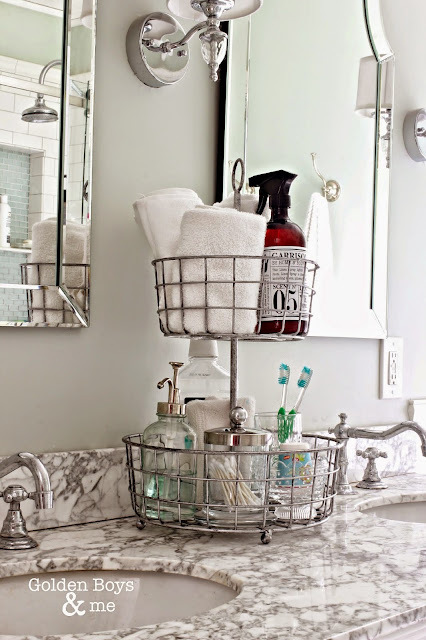 I also use a tiered wire basket to stay organized in our bathroom. 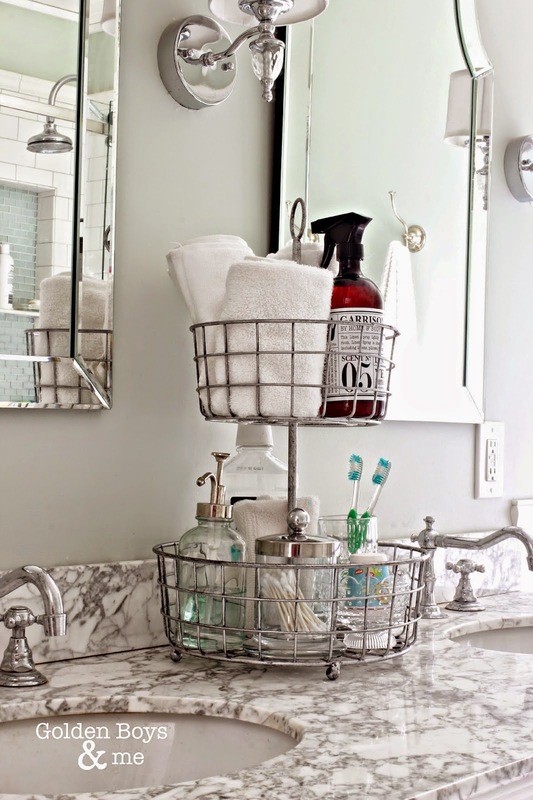 This one holds a bunch of bathroom necessities and keeps them off of the delicate marble countertop. I found the tiered basket stand at HomeGood in the kitchen aisle, but I don't often see them there. I found this one on Amazon and it looks very similar. I have also used this basket to organize items in our bedroom. I have even borrowed this tiered stand to use outside for entertaining. Do you like to use tiered stands around the house? I enjoy hearing about how others have found uses for them. Have a great day! Love tiered stands. It is such a great space saving way to display things. Yours are all so sweet. Hope all is going well for you and you did not get socked with too much snow. Let's hope Spring is coming soon. Love your tiered stands. So cute and useful. I have been looking for one to use for a baby shower. Finally decided to make one. I have 3 pastel pink clear glass plates (very old)(from my mother in law) that are in graduated sizes. I have lots of pretty wine glasses, that are old(from my Mom) that I will use to separate the plates. It is for a baby girl shower, so should be cute! 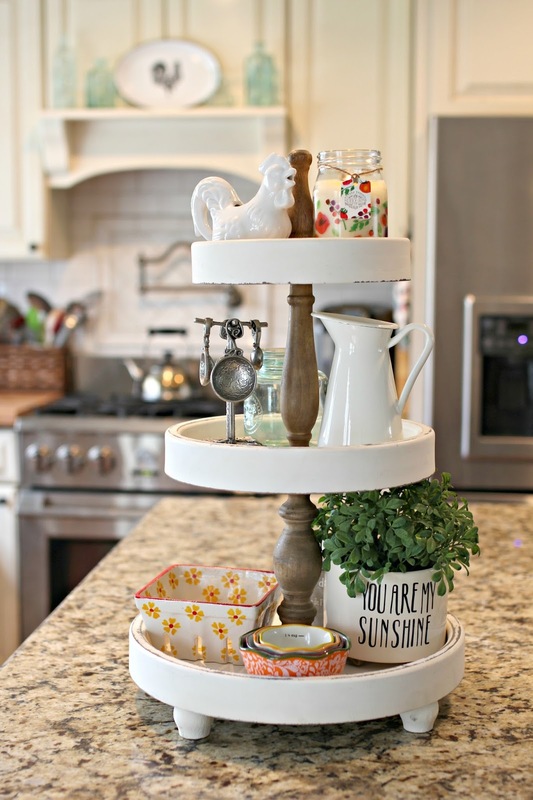 I love your new tiered stand from Home Goods!!! Hope you did not get buried by the Noreaster. Come on Spring!!!! Love your blog!! I recently made a large one and had a lot of fun with it! 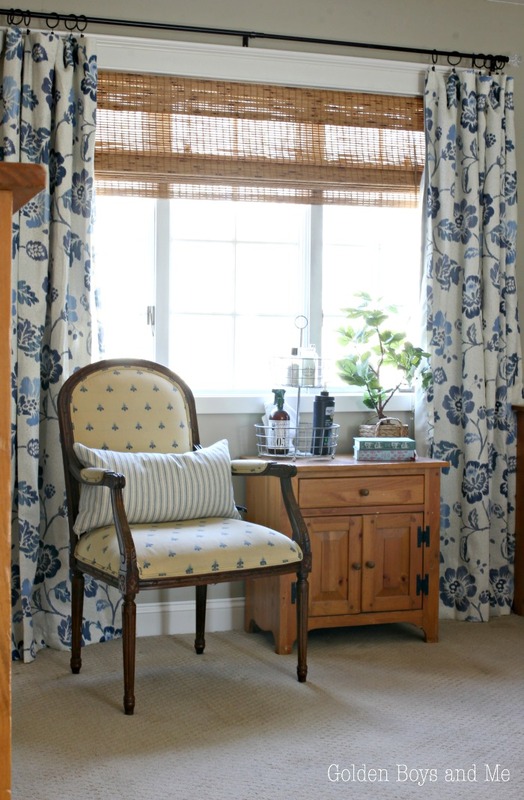 I love all of your ideas and the ways you use them! 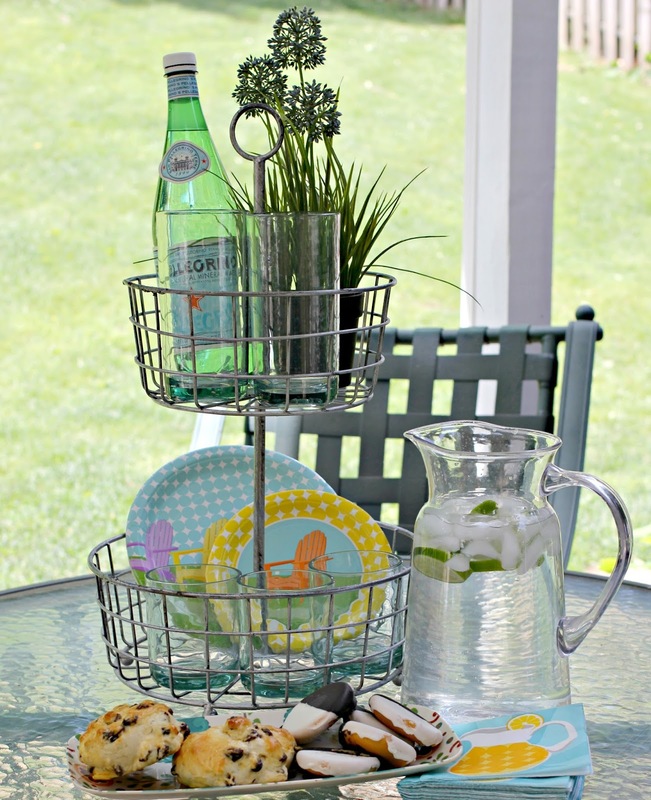 I absolutely love a tiered stand...or any type of tray that I can use to create a vignette. It's the kitchen table centerpiece at the moment filled with lovely spring decor! 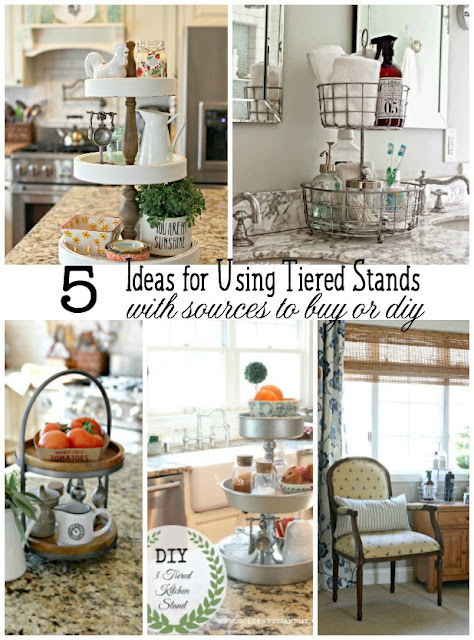 Your tiered stands are so pretty and I love how the white one looks so springy! I have a couple that I use every now and then but now I feel motivated to bring them out more!